My mum was given the option to have me on her birthday but as she pointed out to the doctors she had better things to do on her birthday and I was already 3 weeks late she's rather not spend the day in labour! If' I had been born on her birthday I would have been given a name beginning with V most likely Victoria, I don't think it would suit me but I might have half a chance of spelling it right! 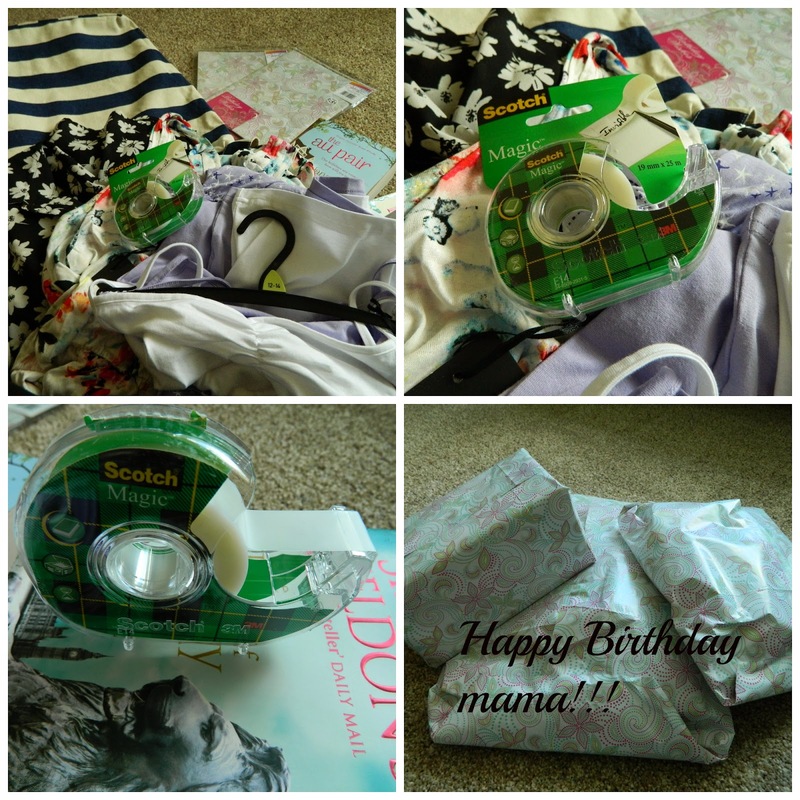 I thought i'd show you some of the things I got her, my mum likes unwrappables and while I am rubbish at wrapping presents, Birthdays and Christmas I always make sure she has things to unwrap and always more than 2. I started in Primark in Leeds and got her a Stripped Beach bag for her next holiday in a few weeks time and a B&W daisy shirt dress, which I was really worried about but she loved. My Next stop was H&M and I really struggled while they had lots of nice things in I couldn't decide if she already had it as she takes me in to our local one and points nice things out to me. I stuck lucky with a beach dress. I also got he a book from the works and I did plan to get her a couple more tops from Primark but they must have been giving things away in my local one as the queues were really long! Tesco came to the rescue in the shape of some purple star print PJ Bottoms and almost matching vest tops and two more books. She has a kindle and we have book cases full of books so it's always a tricky choice I did my usual trick and bough books I knew I hadn't read that sounded good. She's hadn't ready any of them before and has now read the Au Pair and said it was really funny so that will be my next read! I got the wrapping paper from the works 2 packs of 2 sheets for £1 and it's really nice quality. Did I do good as a daughter? my wrapping might not be up to much but she loved everything and it all fitted. She opened them the night before her birthday and had the PJs on within seconds!